We now have fragrance testers available! The tester fluid will not burn in your lamp! 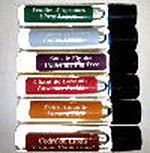 These small vials will allow you to easily experience a fragrance before purchasing. Those who have a small collection of these will also be able to determine which particular scents they wish to purchase when placing an order. These could also be rolled on your pillow case or used like a perfume!